We’re not just a café. We’re a cause. 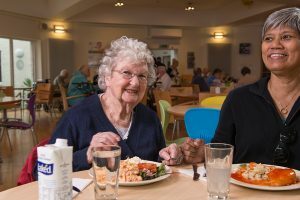 Every penny you spend on our hearty hot meals, scrumptious salads, brews or veg-packed smoothies helps us provide the best possible care for older people and those with dementia in Edinburgh. Our bright, spacious Stockbridge community café is fully accessible and welcomes all; from the young to the, well, young-at-heart. Every weekday, Tony and his team rustle up delicious, nutritious meals that you can have sitting in or take away, in full or half portions – perfect for wee ones or just those with wee appetites. LifeCare’s philosophy is all about giving everyone extra years of zest and this ethos is certainly evident in CaféLife. We use fresh, healthy ingredients and different styles of cuisine, so you can sample something new or savour something you love. We’re here to provide affordable, nutritious meals for the entire community. We’re family friendly, wheelchair friendly, buggy friendly, toddler and baby friendly, breastfeeding friendly. We’re just plain friendly all round. So make us your local café and support a local cause. We’re the heart of the community. For the fourth year running, CafeLife are proud recipients of the Healthy Living award. This illustrates our ongoing commitment to serving you food made with healthier ingredients. CaféLife are champions of health and nutrition. We’re a family friendly, breastfeeding friendly café and, in recognition of this, we have received the Breastfeeding award from NHS Lothian, as part of a pilot project to actively promote Breastfeeding friendly spaces, like ours. Monday to Friday: 8am to 3pm.